UNITED NATIONS, March 23 -- With the focus on Libya, Afghanistan's Permanent Representative to the UN Zahir Tanin sat down across from Inner City Press on March 22 and took a half dozen questions, ranging from UN Peacekeeping and murdered peacekeeper Louis Maxwell to the Karzai government's support for the military action in Libya. For YouTube video, click here. 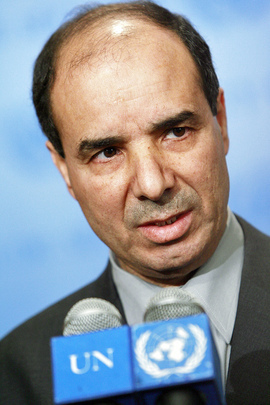 Tanin expressed support for the action in Libya, saying it was to protect civilians. Inner City Press asked him about Germany increasing its presence in Afghanistan to make up for others' military resources transferred to Libya. Tanin indicated that the assets being transferred from Afghanistan weren't of the kind needed that anyway, and that Afghanistan is trying to take over its own security. Inner City Press asked Tanin if the Karzai government has done anything on the public request by the UN, including the American chief of the UN Department of Safety and Security Gregory Starr, that it investigate and prosecute those responsible for shooting the UN's Louis Maxwell, at point blank range and on video. Tanin said he had nothing new on that. And a promised response from the Department of Peacekeeping Operations has not yet arrived. The full story of UNOPS corruption in Afghanistan has yet to be told. One problem is that, as Secretary General Ban Ki-moon's spokesman Martin Nesirky told Inner City Press on March 17, “UNOPS is not going to answer your questions” about Ban's son in law Siddharth Chatterjee's aborted promotion there. And UNOPS still hasn't answered simple questions submitted last week. 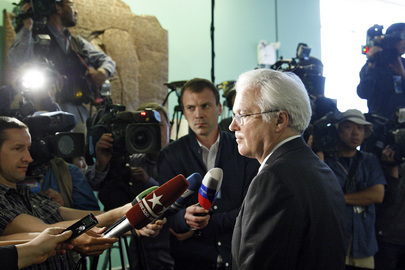 (Chatterjee's previous promotion was to be chief of staff in Iraq of Staffan de Mistura, now Ban's envoy in Afghanistan. Tanin was asked about the Security Council reform process; his answer was an inconclusive as the process seems to some. Watch here, and watch this site.